What we all know: Todays customers, and especially millennials, like to use several channels at the same time when it comes to shopping. The connection of e-commerce and in-store experience is therefor an important task for companies. A very good example are Rebecca Minkoff's connected stores. These tech-integrated stores were built in cooperation with eBay totally new in-store experience. Very impressive is the huge screen that enables customers not only to order drinks and looking at new collections but also to send clothes to their dressing rooms, which is of course also interactive. Requests for different sizes via touch-screen mirror and a system behind that knows what you tried on but didn't buy are just a sneak-peek into the whole experience. The future is the Omnichannel Customer Experience and Rebecca Minkoff did a great job on offering added value for the costumer by melting online and physical world. It remains exciting. The retail experience is going to change significantly. 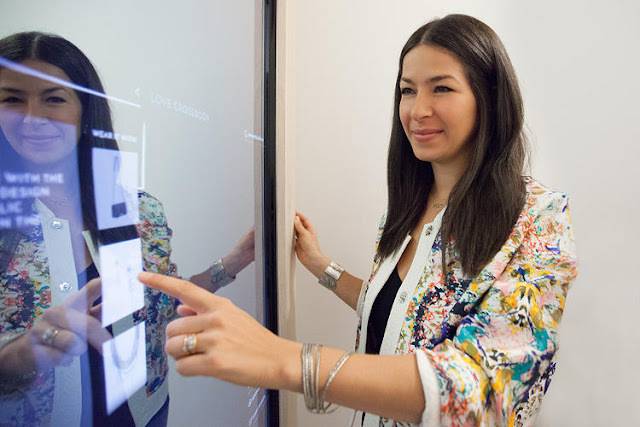 Read more about the Omnichannel Trend at TrendOne and about Rebecca Minkoffs Connected Store at FactCompany.